Taxi to the Dark Side, about the Bush administration's policies on prison torture, has won best documentary at the Tribeca Film Festival. 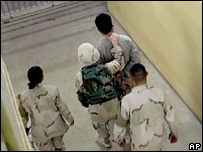 Alex Gibney's film looks at the treatment of prisoners in Guantanamo Bay, Iraq and Afghanistan. Gibney's 2005 film, Enron: The Smartest Guys in the Room, was nominated for an Academy Award. Limp Bizkit frontman Fred Durst's directorial debut, The Education of Charlie Banks, also won an award. He picked up the Made in NY feature film prize. The award for best actress went to Marina Hands in Lady Chatterley, a French version of the DH Lawrence novel. Lofti Edbelli was named as best actor for his turn as a breakdancer who falls in with a fundamentalist group in Tunisian film Making Of. The film, written and directed by Nori Bouzid, also won best screenplay. Jewish drama My Father My Lord, directed by David Volach, won the award for best narrative feature. The film follows an Orthodox rabbi struggling to keep his faith and family. Andrew Piddington's The Killing of John Lennon won special jury recognition, while Enrique Begne's film Two Embraces won the award for best new narrative film-maker. The film festival, which concludes on Sunday, was founded by Robert De Niro after the September 11 attacks, with the aim of revitalising lower Manhattan.